Floating Market boats line the side of the main khlong or canal as well as smaller side canals. They are supplemented by stalls in buildings at the edge of the water. When you visit the town of Damnoen Saduak, which is in the province of Ratchaburi, you’ll be experiencing some of the real life of Thai people. The market itself has a long history although it had been reduced to a small level until it was revitalized by the influx of tourists who want to experience this traditional part of Thai culture. It is now a must-see destination for any tourist to Thailand. 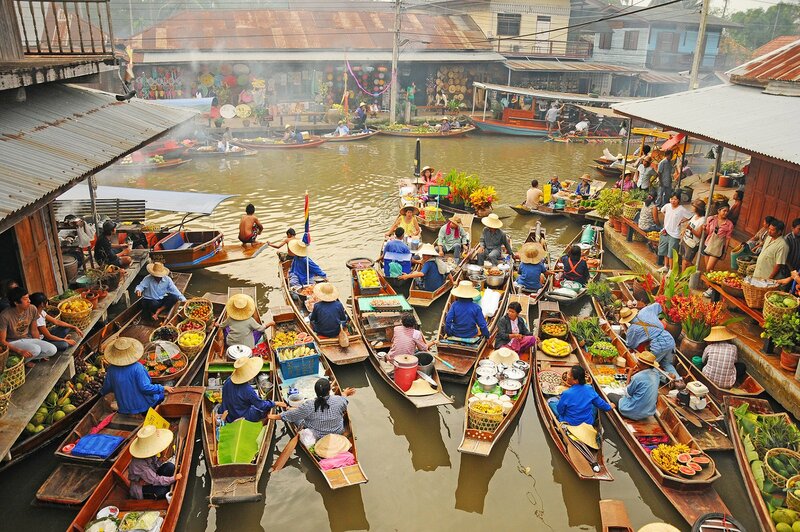 The importance of the floating market to Thai and Indochinese culture comes from the type of landscape that is so common in the area, with many rivers and wet flat plains. These have naturally lead to frequent use of boats for transport, for business and for accommodation over the centuries. So with much of the population in many districts either living on boats or in houses directly on the river ways it is no surprise that enterprising merchants start to deliver their goods by boat. When a large number of merchants take to the water in the same area then it becomes a market, and the floating market was formed. Today with the reduction in use of waterways and boats for commerce and living the floating markets have instead become a respected part of history and culture. Combined with the interest of the many foreigner visitors to Thailand this has helped to preserve this tradition which is unique to the area. TAXI: They won’t go on the meter so you have to use your bartering skills to full effect! Expect to pay around 700 Baht for the return trip, they’ll pick you up from your accommodation around 7am, drive to the market (about 90 mins) wait for 2 hours or so and drive you back at lunchtime. SCAMS: When you arrive in Damnoen Saduak people will try to lure you into their boat jettys. You can take a long boat around the canals, the trip finally gets you to the market for the last 10 minutes of the hour–long journey. The cost of the boat is approximately 800 baht per person or 1500 baht per boat – and to be perfectly honest, it’s a cheap scam.